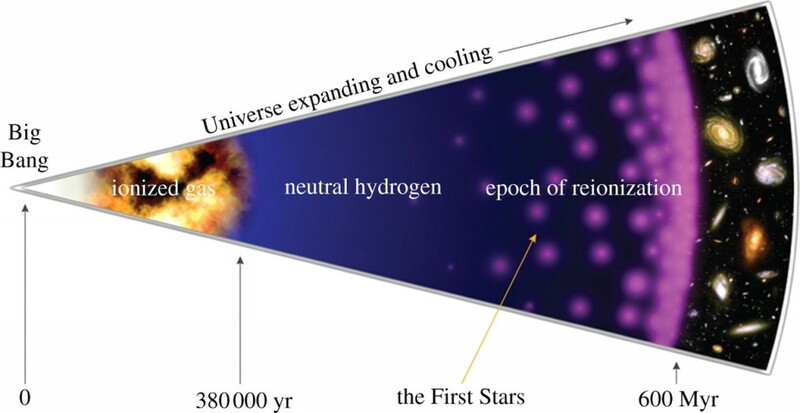 One of the most transformative epochs during the Universe’s lifetime was the Epoch of Reionization (see here for a selection of astrobite articles covering this topic; also Fig 1). When the Universe had cooled down sufficiently to form atoms, about 400,000 years after the Big Bang, it consisted mainly of neutral hydrogen atoms. However, it wasn’t until the first stars started appearing which blasted their surroundings with ionizing ultraviolet radiation that the Cosmos began to – slowly – become ionized. Today, it is almost fully ionized. You can easily observe this fact when looking at the night sky: if the hydrogen in the Universe had remained neutral, the light from stars and galaxies would not reach our eyes and instruments, but rather would have been absorbed by the intervening gas. Fig 1: The history of the Universe, showing how the ionized gas in the Universe became neutral as the Universe expanded and cooled. When the first stars (and, soon after, galaxies) started forming, their ionizing ultraviolet radiation contributed to another change in phase: the Epoch of Reionization. How to Ionize a Universe? However, in order to understand better how this process of reionization occurred, we need to know more about those early stars and galaxies which were responsible for pumping out high-energy ionizing ultraviolet radiation. This is what the authors of today’s astrobite paper were studying. In particular, they aimed to determine the ultraviolet luminosity function during different epochs in the Universe’s history. This measures how many galaxies there are of a given UV luminosity, or intrinsic brightness, at any particular age (or redshift) of the Universe. Probing the faint end of this luminosity function can give us clues about how many small, less luminous galaxies there are – the type of galaxies that are normally very hard to observe directly due to their faintness, but that might provide a significant amount of ionizing radiation! The authors are trying to determine if the luminosity function during the epoch of reionization was steep, meaning that “the UV luminosity density – and therefore the ionizing photons responsible for the reionization of the Universe – are dominated by faint galaxies”. This is the reason why they were particularly interested in distant, intrinsically faint galaxies. While there are many models and theories describing the evolution of the ultraviolet luminosity function at different times during the Universe’s history, the authors of today’s paper argue that only a luminosity function which predicts a lot of such small, not-very-intrinsically-bright galaxies can produce enough UV photons to achieve reionization. However, simulations of the evolution of the history of the Universe predict a flattening off of the luminosity function, meaning that there are a lot fewer small, faint galaxies than would be needed to complete reionization. This modelled dearth of less luminous galaxies might be due to the difficulty of forming stars in very small galaxies: as they are heated by the background light, they do not cool down enough to form stars efficiently, hence making star formation difficult. These model simulations are also confirmed by observations of local dwarf galaxies which should be some hundred times more abundant if larger numbers of faint galaxies had formed in the early Universe. In order to count the number of galaxies in the distant Universe, the authors analyse the Hubble Frontier Fields clusters Abell 2744 and MACS 0416. They make use of a technique called wavelet decomposition which breaks the image into its components at different scales: in Fig 2a and 2b, it can be seen how the the technique identifies larger structures and separates them from smaller ones. The largest scales result from intercluster light while on smaller scales background galaxies begin to appear. These small background galaxies are the actual target of this analysis. 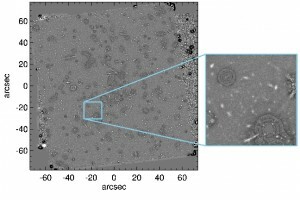 By substracting the foreground light and other objects, the authors create an image of only the most distant sources visible (see Fig 3), for which they determine the photometric redshift in order to calculate how many galaxies of a given brightness are in each redshift bin (i.e. the luminosity function for these galaxies). 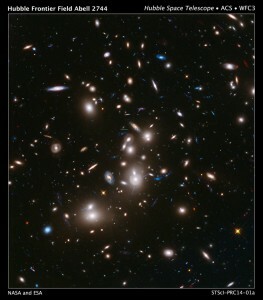 Fig 2a: The Hubble Frontiers Field cluster Abell 2744. Foreground and background galaxies of different projected sizes can be seen, as well as the diffuse intercluster light which permeates the foreground. Fig 2b: By using a technique called wavelet decomposition, the authors break the observations of the Hubble Frontiers Field clusters into their constituent components of different size scales. The largest component (j=9) corresponds to the diffuse intercluster light, while the smaller components (j=4 and below; top row) show the distant galaxies thought to be responsible for reionization. Fig 3: After substracting the larger more nearby structures as well as the intercluster light, the distant galaxies become visible and can be studied directly. Having established a sample of galaxies at redshift between 6 and 8 – corresponding to epochs when the Universe was between 650 and 950 million years old – the authors determine how complete their sample is. For this they create a large number of model galaxies and compare them to their observations. This allows the authors to calculate the effective volume of their sample, and hence how many galaxies of a given brightness can be found in each redshift bin. They find that their observations do, indeed, show that there are enough small, faint galaxies present in the early Universe to complete reionization by the time the Universe is just under one giga-year (one billion years) old. While there is still much we don’t understand or know about the Epoch of Reionization, it seems promising that the authors of today’s paper conclude that their observations “provide the first empirical evidence” that there were enough star-forming galaxies in the early Universe to complete reionization by one billion years after the Big Bang. Great post! I have just a few questions regarding the determination of the completeness of the sample and volume of the sample. 1. How are the authors able to determine the completeness of the sample? Does it mean that they calculate the number of galaxies they expect to see, according to their model, with redshifts between 6 and 8 in that particular field of view, and compare that number to the number of the actual galaxies they see? 2. What is the effective volume of the sample?